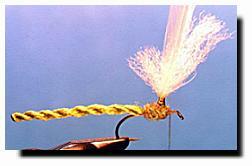 Fly Angler's OnLine "Beginning Fly Tying Part 23"
Can you identify these insects? How many of you said dragonflies? They look like dragonflies, don't they? Not to the trained eye. Those love bugs are damselflies involved in the annual procreation of the species. So, why do I start this week's lesson with an X-rated picture? Well, maybe it isn't X-rated, but it does show an important point. If you plan to tie flies to match the local insects, it helps to be able to identify those insects. Although dragonflies and damselflies look a lot alike, there is one easy-to-identify difference between the species. 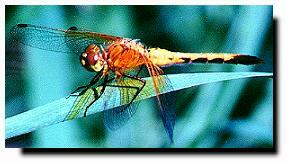 Dragonflies hold their wings to the sides when they are at rest. This is a more important feature than size or coloration since both species vary a bit in size and coloration. When you look at a damselfly that's resting its wings are folded over its back. 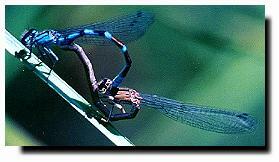 Next time you see one of these creatures, look to see if it's a dragonfly or damselfly. There are some major differences between dragonfly and damselfly nymphs and their imitations. However, when one of the adults of these species gets trapped in the surface film of the water, they look pretty much alike. That's why you can use an extended body parachute fly to imitate both species of adults. However, if the fish are picking up on the subtle differences, you'll need to be able to identify those differences yourself and accommodate the fish's tastes. So, why did I point out these differences just to say it doesn't matter much when it comes to imitations? To point out a fact about all of fly tying. Some flies do a good job imitating a lot of insects while others are real specific in what they imitate. If you can identify the insect and its characteristics, you can often adapt several patterns to match that insect. And, sometimes, a particular pattern will serve a multiple purpose without any adaptation at all. This week's pattern is adaptable to dragonflies, damselflies and craneflies by merely changing the color and size. It uses a new twist on how to hackle a parachute fly that makes it harder for fish to strip the hackle from the parachute post. It also uses a material for the body and post we haven't used so far. Do you have your creativity cap on? Good. Let's create a fly that's very different from any we've done so far. Hook: Standard dry fly; Mustad 94840, Tiemco 100, Eagle Claw L059, Daiichi 1180. Size 4 - 10 (8 -14 for craneflies). Tail: Twisted polypropylene yarn or antron yarn, an extension of the body, choose the color of the natural you want to imitate. Body: Polypropylene or antron yarn and dubbing, color of natural insect you with to imitate. Wing: Polypropylene yarn or antron yarn, white is the most common color, but you could use any other color desired, including bright colors for increased visibility. Hackle: Quality pale blue dun or any other desired color, neck or saddle hackle, webby parts removed and 1/8" of the remaining stem stripped of barbules. The barbule length of these hackles should be about twice the hook gape. 1. 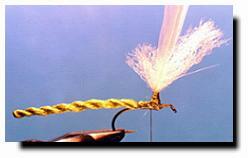 Select a length of polypropylene or antron yarn about 3 to 4 times as long as the post wing should be. Loop the yarn under the hook, one side a little longer than the other, pull it up and tie it in with a combination of figure-8 wraps and wraps around the bottom of the post. 2. Wrap the thread up and down the base of the post wing a few times to strengthen it and to give you a firm foundation for wrapping the hackle. Don't worry about the length of the wing yet, we'll fix that later. 3. 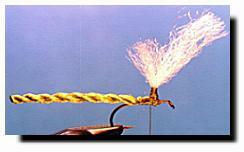 Tie in a piece of polypropylene or antron yarn that's at least six inches long, just behind the wing. 4. Twist the yarn tight. Continue twisting until it won't twist anymore. 5. Pinch the yarn at the point where you want the tail to end, then bring the rest of the yarn forward past the wing. Keep the tension on the yarn so the twist won't relax. 6. Relax your grip on the tail enough to feel the direction it will want to twist, then roll it in your fingers that direction until it rolls up tight. If it isn't completely straight, you can pull it straight by hand. 7. Continue to keep twisting pressure on the yarn and tie it off behind the wing. Secure it with a few tight wraps of thread to prevent it from relaxing. 8. Twist the tail tight again, straighten it, and soak it with head cement. Apply a few drops of head cement to the wing base too. Wait a few minutes for the cement to dry. This cement will provide structure or stiffness to the tail without adding so much weight that the tail will sink. 9. 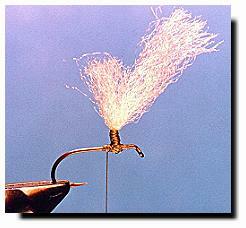 After the cement has dried, attach the hackle stem to the base of the wing. You left the hackle stem 1/8 inch long instead of 1/16 inch to allow enough stem to thoroughly attach the stem to both the wing base and the hook. 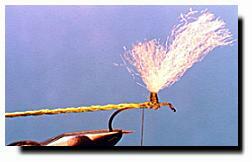 Your hackle should now be extending above the wing, curvature facing out. 11. 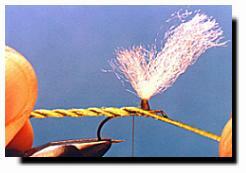 Wrap the hackle down the wing base, keeping the curvature of the hackle facing downward. This will angle the tips of the barbules downward, causing the fly to ride slightly higher in the surface film than it would if you wrapped the hackle up then down the wing base. 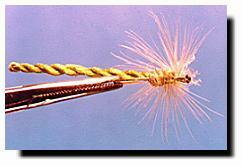 Tie off the hackle with a couple of thread wraps, trim and secure with a half hitch. 12. 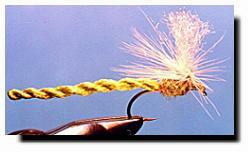 Push the hackle back at the front of the fly creating a gap in the hackle. Grasp one of the strands of yarn you used for the wing (I left one a bit longer than the other for this purpose), and pull it down between the gap you created in the hackle at the front of the fly. 13. Tie off the yarn at the hook eye. 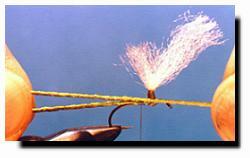 Trim and secure tightly to the hook. Trim the upright wing to length at this time. 14. 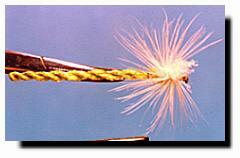 Build a head of thread, whip finish and cement. You can apply another drop of cement to the wing base if desired. 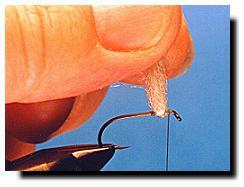 Your finished fly should look like this. These top and bottom views show how the hackle looks from the top and bottom. Since it is fanned to the sides and back, but not over the front, it looks more natural as a damselfly imitation. Experiment a little with different colors and lengths of yarn for different insects. You will find that you can do a good job matching craneflies, stoneflies and caddisflies with this twisted yarn technique. 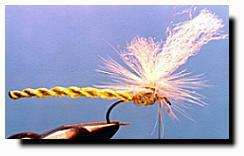 All you need to do is change the hackle color, and yarn color and length, and the size and length of the fly. My favorite statement at this point is one you're probably a little tired of, but one I can't stress enough to keep you working on the creative part of this hobby. "It's your fly, tie it the way you want it to look."